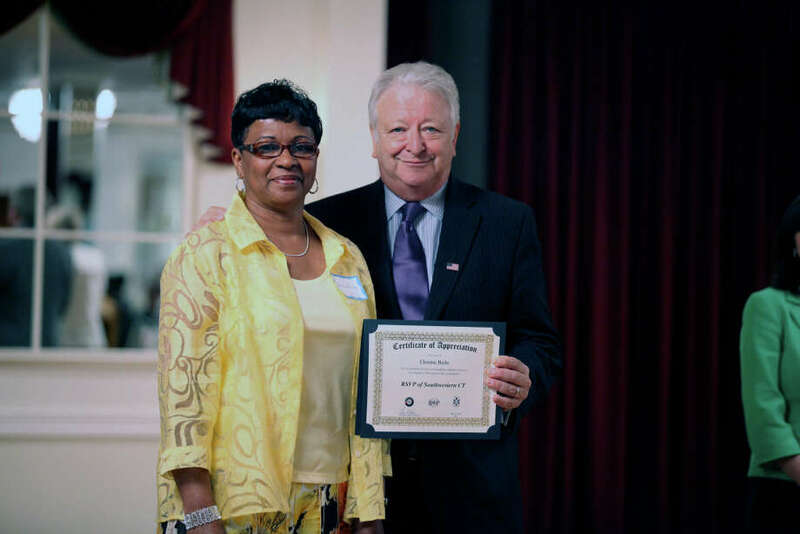 RSVP volunteer Donna Burke receives recognition from Norwalk Mayor Richard Moccia for donating her time to the Norwalk Senior Center, Norwalk Reads and the Norwalk and East Norwalk Libraries. The Retired and Senior Volunteer Program of Southwestern Connecticut held its 37th Volunteer Recognition Celebration last month at Continental Manor in Norwalk. More than 350 volunteers were honored for donating their time to more than 50 local non-profit agencies during this past year. RSVP serves the communities of Darien, Greenwich, New Canaan, Norwalk, Stamford, Weston, Westport and Wilton. Speakers at the annual luncheon were Teri Klein, RSVP project director; Anne Ostberg, state program director for the Corporation for National & Community Service, of which RSVP is a part; and Connecticut state Sen. Bob Duff (D-Norwalk). Norwalk Mayor Richard Moccia, Weston First Selectman Gayle Weinstein and Wilton First Selectman William Brennan presented awards to volunteers who are outstanding representative of programs that positively impact the community. These included Christine Burke, who volunteers at Norwalk Senior Center, Norwalk Reads, Norwalk and East Norwalk Libraries, and several other local agencies; Betty-Jo Corridon who helps with the Wilton Food Pantry and other Wilton organizations; Linda Fein, who volunteers at Kingsway in Norwalk, Wilton Library and is a member of Wilton's Emergency Readiness Team; Bob Forte, a talented singer and musician who provides cultural enrichment to seniors in a number of locations; Carol Nardi who knits baby blankets that are given by RSVP to places such as the Norwalk Community Health Center and Family and Children's Agency for distribution to new parents; Nancy Robinson, a valuable member of the Norwalk Tree Alliance; Barbara Stemmer, dispatcher for the RSVP Medical Transportation Program, which serves seniors in Westport and Weston; and Skip Williamson, who volunteers his time both reading to pre-schoolers as well as tutoring middle and high school students in programs at NEON. Anna Young was also honored for her role in obtaining more than 30 gift certificates from area businesses, which were given as prizes at the luncheon. At 100 years old, Young is RSVP's eldest volunteer. Entertainment was provided by the Blue Notes, a community-based volunteer singing group from Darien. The annual luncheon was made possible with support from Norwalk Community College, the Westport Woman's Club, the William and Sally Tandet Center, Calvary Baptist Church, East Norwalk Library, Norwalk Community Health Center, Norwalk Housing Authority, Stamford Museum & Nature Center, Betty Voutsinas, and the Wilton Community Team. Centerpieces were provided by Bruce's Flowers. Other organizations that offer continued support to RSVP of Southwestern Connecticut include The Corporation for National & Community Service, the City of Norwalk, CT Department of Social Services' Aging Services Division, and the Town of Wilton. Special thanks were also given to NEON, Inc., the NEON Board of Directors and the RSVP Advisory Council. NEON is the sponsoring agency for RSVP of Southwestern Connecticut. Anyone age 55 and over can become an RSVP Volunteer, and assist in a variety of programs that benefit the community. For information contact Nancy Pratt, Outreach Coordinator at (203) 633-7332 or e-mail npratt@neon-norwalk.org.